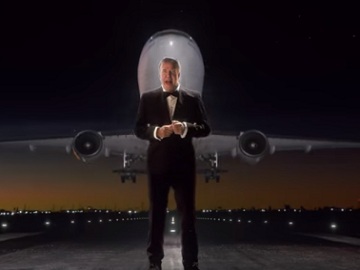 Jeremy Clarkson presents the new fully enclosed Boeing 777 First Class Suite from Emirates in a new commercial for the airline, titled “Game Changer”. anything else is a disappointment.” – Clarkson, who is all dressed up for the occasion, says at the beginning of the 60-second spot. He then starts listing some of the most important features of the interior, naming the high-definition touchscreen display that’s bigger than his TV at home, minibar, and leather seats with hand stitches “that will make you think ‘Oh, hang on, this is the way to travel'”. Clarkson invites you to try the zero gravity seat position if you want to relax or sleep, mentioning that “this is better than lying on a fairy tale cloud”. According to his presentation, there is also technology that lets you choose what sort of lighting and temperature you’d like, and, in addition to that, “something called virtual windows”. The English broadcaster, standing on a landing strip, also informs us that this Boeing has a top speed of 700m/h. As an aircraft is seen taking off, Clarkson, whose suit is taken away by the gust, is left in pajamas. “And it comes with pajamas.” – he adds. The commercial ends with the voiceover introducing the “fully enclosed first-class suite from Emirates”, mentioning it is inspired by Mercedes-Benz.